This entry will be so brief, it will rival a tweet, but this is pure gold. 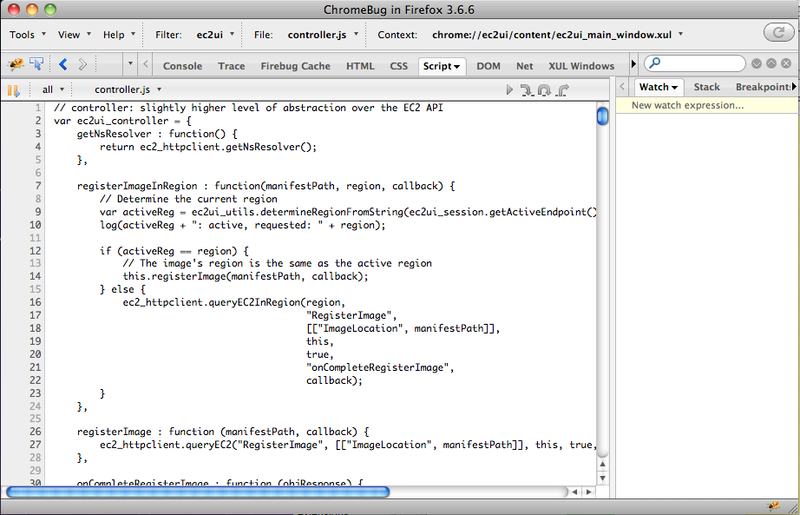 If there is any one thing that I found helpful when I needed to debug a Firefox plugin, it was Chromebug. This is the debugger used to debug Firebug, so you know it has what it takes! (yes, I tried Venkman. Fine for some things… just no this) So, get it, follow the instructions and be happy! Using “autorelease” can really bite you! This will be a short post, but there was a lot behind it. Trust me! A few times, I’ve run into cases where my code didn’t run as expected. I’d initialize an object (sometimes in viewDidLoad()). Later, maybe in viewWillAppear(), or in a button delegate, I’d try to access that object and use it. The debugger would show an EXC_BAD_ACCESS. I’d step through the code and sometimes, the object would appear normal in the inspector. Other times, the debugger would think it was of a different type!?! I thought I was being smart by allow the object to be cleaned up for me. In fact, I was causing a problem because I apparently don’t understand the behavior of autorelease. It turns out it can cause objects to be released early. I would say avoid autorelease! It has bitten me several times now! In the iPhone work I’ve been doing (my app), I’ve seen one error a number of times.. with various causes that were hard to track down. I’d see TERMINATED_DUE_TO_UNCAUGHT_EXCEPTION and never got a good stack trace. I found the solution in an iPhone dev forum (here) and thought I’d write this up to share the answer in case it saves someone some time. What you need to do is set a breakpoint in objc_throw_exception. To do that, create a .gdbinit file in your home directory. Add the following to that file (I think the last line is the most important, but I have all of this in mine).